Group photo of Famous Artists School Faculty. Austin Briggs (rear, far right), and Robert Fawcett (front, far right). ©Norman Rockwell Museum Collecton, gift of Famous Artists School. All rights reserved. Stockbridge, MA, June 29, 2017—Established in 1948 by a group of artists led by Norman Rockwell and former Society of illustrators President Albert Dorne, the Famous Artists School, in Westport, Connecticut, became a household name during the mid-twentieth century. It offered aspiring artists correspondence courses in illustration, painting, and cartooning as a viable path to a creative and successful career, or, as the School put it, to a “Richer Life Through Art.” This summer, a special exhibition at the Norman Rockwell Museum will explore the artworks and creative methods featured in the program, during the 1940s and 1950s. Titled Learning from the Masters: The Famous Artists School, it will remain on view from July 8 through November 19, 2017. The works in the exhibition have been curated from a group of over 6,000 objects from the archives of the Famous Artists School that are now part of the Museum’s permanent collection and the subject of a new book, Drawing Lessons from the Famous Artists School: Classic Techniques and Expert Tips from the Golden Age of Illustration, written by exhibition co-curators Stephanie Haboush Plunkett, Deputy Director and Chief Curator at the Rockwell Museum, and Magdalen Livesey, President of Cortina Learning International. The Famous Artists School was founded by twelve noted artists and illustrators whose work reached millions through the covers and pages of the nation’s most popular mid-century publications. 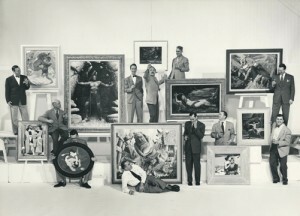 In addition to Rockwell and Dorne, these included John Atherton, Austin Briggs, Stevan Dohanos, Robert Fawcett, Peter Helck, Fred Ludekens, Al Parker, Harold von Schmidt, Ben Stahl, and Jon Whitcomb. Students who enrolled in the program received coursework and feedback modeled after the working methods of these artists, who were among America’s most highly regarded illustrators, and who had created a curriculum based upon their artistic techniques. This curriculum attracted more than 60,000 students during its heyday from the 1940s through 1960s, among them numerous soldiers returning from service, thanks to marketing efforts that included door-to-door sales and advertisements in magazines and comic books, often featuring a likeness of Rockwell with the tag line: “We’re looking for people who love to draw….” Through the years, the course was updated with new lessons and new famous artists. In 2014, the Norman Rockwell Museum became the beneficiary of a substantial collection of original art, photographs, lesson plans, and other archival materials from the Famous Artists School’s current owners, Magdalen and Robert Livesey. Processing of these materials has been made possibly by a generous grant from the Andrew J. Sordoni Foundation. Learning from the Masters will include original artworks, studies, photographs, archival films documenting live demonstrations and commentary by the artists, contemporary interviews, and lesson plans. The exhibition is organized into seven sections that explore the major instructional themes that the famous illustrators identified as foundational for artists—The Art of the Story explores the process of creating a visual narrative through such examples as Norman Rockwell’s whimsical Saturday Evening Post cover Art Critic, and Al Dorne’s biting Collier’s illustration Six Greedy Loafers, both from 1955; Making it Personal illustrates how artists such as John Atherton (Self Portrait as Fisherman, c. 1948) can express their personal point of view by infusing themselves and the world around them into their art; Drawing as a Tool for Seeing showcases such creative approaches to drawing as Al Parker’s pastel on paper illustrations; Composing for Best Effect shows how artists such as Robert Fawcett (Man on Ledge, 1941) create a strong sense of mood and drama; The Well-Designed Image demonstrates the use of balance, color, contrast, size, and attitude, to create such effective works as Fred Ludekens’ 1950 story illustration The Outlaw of Longbow; Drawing the Figure details how such artists as Jon Whitcomb effectively portray the figure in motion and in space, casting and working with models and photographic references; and An Eye for Color illuminates how such works as Peter Helck’s Melt Shop (n.d.) have been brought to life through the creative use of color. A special opening event on Thursday, July 20, from 5:30 to 7:30 p.m., will celebrate the exhibition and new book Drawing Lessons from the Famous Artists School: Classic Techniques and Expert Tips from the Golden Age of Illustration, published by Quarry/Quarto Books and available in the Museum’s store. Co-authored by Stephanie Haboush Plunkett, Norman Rockwell Museum’s Chief Curator/Deputy Director, and Magdalen Livesey, President of Cortina Learning International, the book explores the riches of the collection, offering lessons and commentary inspired by the acclaimed course. Commentary by the curators and by former Famous Artists School teacher Randy Enos is scheduled for 6:15 p.m., followed by a book-signing and “draw and sip,” with free drawing kits available courtesy of Faber Castell (while supplies last). The event is being sponsored, in part, by TownVibe, Faber Castell, and Rockport Publishers/Quarto Publishing Group USA. Thursdays, July 27, August 17, September 14, October 19, 1:30 p.m. Explore the step-by-step process of creating effective works of art as outlined by the illustrators of the Famous Artists School with artist/educator Patrick O’Donnell, who will demonstrate the techniques of Norman Rockwell, Al Parker, Al Dorne, Austin Briggs, and other noted founders of this popular mid-century correspondence course. Free for Museum members, or included with Museum admission. Monday, August 7 through Friday, August 11, 10 a.m. to 3 p.m.
Immerse yourself in the step-by-step drawing methods of the Famous Artists School course with illustrator/educator Patrick O’Donnell. Explore creative, technical, and narrative approaches that train the eye and the hand in the techniques of the illustration masters. Approaches to the figure—including the head, hands, facial expressions, movement, and much more, will be a focus of this exciting workshop for all levels of experience. $230; $195 for Museum members. Pre-registration required by contacting: register@nrm.org or 413.931.2221. Learn about the little-known inner workings of the Famous Artists School from illustrator Randy Enos, who worked as a course instructor from 1956 to 1964, and others who had first-hand experience with this popular mid-century art correspondence course. Illustrator Elwood Smith, a student of the course, will offer first-hand observations. Free for Museum members, or included with Museum admission. Saturdays, September 2, October 7, 1:30 p.m.
Join illustrator/painter Dan Howe as he illustrates Norman Rockwell’s process for creating a painted image. Through live drawing and painting demonstrations and discussions, the step-by-step technique of America’s most beloved illustrator will be brought to life. Free for Museum members, or included with Museum admission. Saturday, October 21, 1 to 4 p.m. Enjoy this exciting afternoon inspired by the illustrators of the Famous Artists School. Drawing demonstrations and hands-on art activities with noted illustrators will share the secrets of the trade. Create your own masterpieces to take home. Free for Museum members, or included with Museum admission. The National Center for Arts Research recently announced the 2017 Arts Vibrancy Index report that ranks the Berkshires as No. 1 amongst medium-sized communities in the nation. Less than three hours from New York City and Boston, the Berkshires offers culture and adventure year-round. The surrounding mountains provide plenty of opportunity for outdoor excursions in all seasons while world class culture and entertainment, along with a deeply rooted food culture and an array of lodging options amidst picturesque towns, set this region apart. For more info visit berkshires.org.